You guys, Scandal is back. And this whole winter hiatus, I’ve been thinking about whether I wanted to bring back my Scandal Sunday episode reviews or keep up with Sunday Funnies instead. 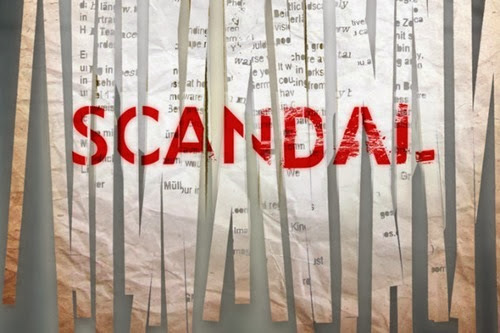 Looks like I’ll always choose Scandal, because this mid-season premiere was – I don’t even know the right word for it. Crazy, insane, amazing, unbelievable?? All of the above. Titled “Run,” this 10th episode of the season was all about Olivia’s kidnapping and it was done completely differently from every other Scandal episode. It focused on one story line only. It was all about one character. The pace was much slower than normal. There weren’t even camera clicks throughout the episode as usual. While it began with the way the last episode before the break ended, this time it focused on things from Olivia’s viewpoint, while showing off how close Jake was to being in the room when Olivia was taken. He was literally right on the other side of the wall. But he didn’t hear her screaming. He did jump into action right away, running outside in his underwear to try to find her, but unfortunately, the kidnappers held her in her never-before-seen neighbor’s apartment until he left the building for good. (The neighbor’s apartment will come back in next week’s episode, when we start to see how everyone else reacted to Olivia’s disappearance). Kerry Washington gave a phenomenal performance in this episode and after they leave her building, the kidnappers ask Olivia to try to negotiate for her life. She refuses, saying she only negotiates with those who actually have power, and the way Kerry delivered these lines was amazing – she is shaking so hard you can barely understand her, but she still comes off as powerfully strong and Olivia-like. After she is knocked out, Olivia wakes up again in a cell – and she is not alone. This other prisoner seemed curious to me, like maybe he was a hallucination, but as it turns out, he was in on everything all along. In fact, he appears to be the head kidnapper in the end. But before she realizes that, Olivia takes on her fixer role to inform him that she will get them out of there, although he assures her there is no way out. Time passes, which is shown by Olivia getting dirtier and her hair getting stringier as each day goes by. Olivia attempts escape through the bathroom window, but when she is caught, first her prisoner buddy is killed (although not really) and then they close up the window. She has a dream in which Jake saves her and delivers her safely to – not the beach with him, but her Vermont house with Fitz. I did not expect to see Tony Goldwyn in this episode at all, and when he appeared I was quite happy about it! There are multiple interpretations of the dream sequence, but to me it stood for what Olivia truly wants in this world. She wants to be living a domestic, happy, sunny life with Fitz in their house. Although the dream turns scary with the appearance of Tom stating that she’s not supposed to be there and Abby telling her that she didn’t choose this life and trying to remind her of all of the other people she is “supposed” to be caring for, I think Olivia is staying alive because of her hope. And her hope is about Fitz. 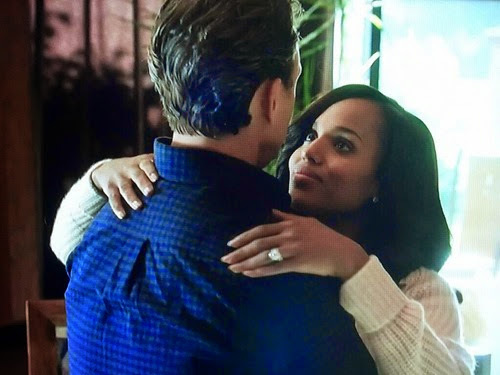 A few episodes ago, I pointed out that Olivia giving Fitz hope was like giving him life. Well, this time it’s giving Olivia life. Abby’s words remind her that she didn’t choose to move to Vermont all the times that she had that choice, and now that she chose herself, she’s on her own – she has to save herself. By the way, that ring? 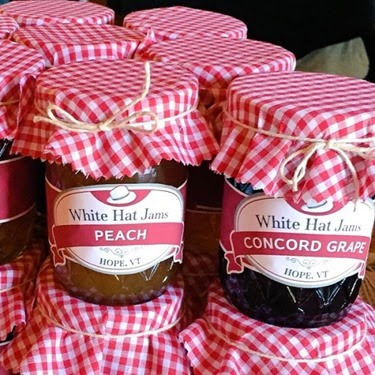 And the jam – made in Hope, VT? And then you see her walking a dog – the same dog that belonged to Amanda Tanner in episode 1.01. All of this is so sad because it will never happen like this. But could it? Maybe one day? I don’t know. Back to reality. Olivia eventually figures out how to escape – she knocks out one kidnapper with a pipe and shoots the other one right in the head, but when she finally unlocks the doors keeping her in, she’s not in a foreign country like she thought. She’s on a sound stage. WHAT?! Ian returns to inform her that he isn’t a fellow prisoner after all. He told her there was no way out. He knew she had fight in her. He had questions he needed answered, but he was told she had to be returned in her “original packaging.” He informs her that the secret to her is that she always has to save everyone. By making her think that he needed to be saved, he got her to confide in him. And she told him that if she’s missing, the President is never going to stop looking for her. Now, Ian knows that Fitz loves her. Apparently, somehow that information is important to him. However – isn’t that the reason she was kidnapped in the first place? Because the Vice President wanted the President to declare war and he knew Fitz would do anything to keep Olivia safe? So what does it mean that Ian didn’t know that information? I know a lot of my fellow fans found this episode to be too little too late, a rip off of Alias, and ridiculous, but I agree with the critics saying Kerry should get an Emmy for this! And I’m actually really looking forward to see what happens next. For everyone involved. If you watched, let me know what you think!